Short john wetsuit is a summer wetsuit. It is a cross between a shorty and a long john. It has no sleeves for your arms and short ones for your legs. No neoprene on your arms means easier paddling because every millimeter of neoprene on your arms and shoulder means resistance that meets your every paddle. 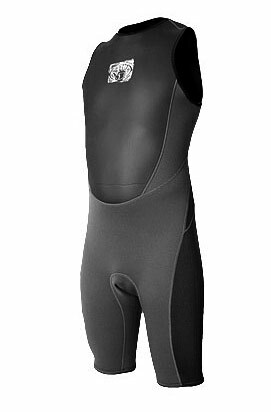 Short john wetsuit is meant for summer surfing and surfing in warm waters at temperatures about the same as they are for a shorty – around 72F/22C or when there is wind, lower air temperature, bad weather. Neoprene thickness in short john wetsuits is usually 2 millimeters. Seams are flatlocked – not waterproof. Great summer wetsuit if you like the free feeling of your arms. I am soon to be doing the British Gas Great Swim which apparently this year for all swims it will be compulsory to wear a wetsuit of some kind. The shortjohn wetsuit seems appealing to me as I’m not keen on wearing wetsuits and the no-sleeve, short leg one appeals to me. First of all, is that a ‘swimming’ wetsuit; secondly, do you know if i applies to the Great Swim rules?